Concrete garage floors are extremely durable and will last you for many years. To maintain the look of your garage floor, you will likely need to clean it at least once every year. Dirt and grime can build up on concrete floors over time, and oil and grease can leak from your car or truck, leaving stains behind that are very unsightly. Fortunately, it’s not all that difficult to remove these stains and get your garage floor looking like new again. If you have oil or grease stains on your garage floor, the first thing you should do is cover them with either sawdust or kitty litter. These materials are highly absorbent and will help draw up the excess oil or grease on the floor. Lowe’s recommends letting it sit on top of the stains for about a day and then coming back to the spots with a push broom and sweeping up all of the sawdust or kitty litter as well as any dirt that might be on the floor. While this is an ideal first step – and may even prevent a stain entirely in some situations – you mays still have a residue left behind. To tackle this, you can pour either dry dishwashing detergent or the concrete cleaning solution of your choice on the stains and let them sit for about an hour. This will start to break down the particles that cause stains, allowing them to be more easily removed. After soaking, pour a pot of boiling hot water over the stains and scrub the affected area with a pushbroom to pull out the stains and restore the look of your garage floor. In some cases, the stains might be stubborn, in which case you may have to bring in muriatic acid. This acid is great for removing the most pernicious stains, but should be handled with great care. Follow all directions from the manufacturer, and be sure to use baking soda or another strong base on the treated area to neutralize the acidity once you’re done cleaning. Templin Concrete Construction specializes in providing homeowners with concrete driveways, patios, countertops and more. 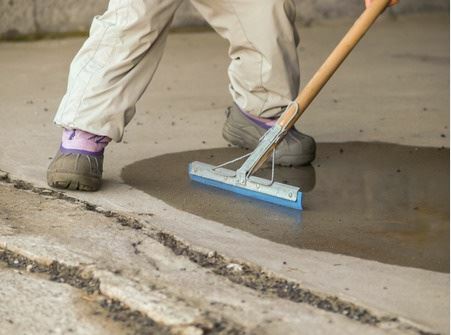 We also offer concrete garage floor installation, and can offer you recommendations and tips to help care for it properly or offer sealing services to provide extra protection for your new floor. To learn more, call us at 612-388-1945 today and schedule a consultation for your concrete garage floor.